Astrophysicists prepare weather forecasts for planets beyond our solar system using Kepler data to find evidence of daily weather cycles on exoplanets "Cloudy for the morning, turning to clear with scorching heat in the afternoon." While this might describe a typical late-summer day in many places on Earth, it may also apply to planets outside our solar system, according to a new study by an international team of astrophysicists from the University of Toronto, York University and Queen's University Belfast. Using sensitive observations from the Kepler space telescope, the researchers have uncovered evidence of daily weather cycles on six extra-solar planets seen to exhibit different phases. Such phase variations occur as different portions of these planets reflect light from their stars, similar to the way our own moon cycles though different phases. Among the findings are indications of cloudy mornings on four of them and hot, clear afternoons on two others. 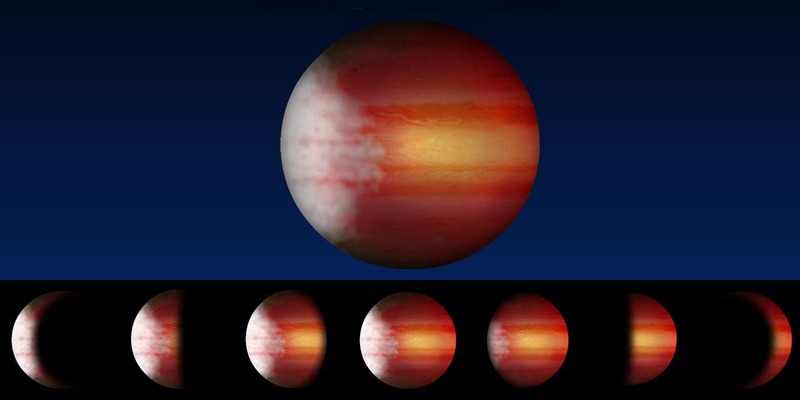 The artist's rendering above of an exoplanet with cloudy mornings and clear, scorching afternoons, exhibiting a cycle of phase variations that occur as different portions of the planet are illuminated by its star, as seen from Earth. Astronomers at the University of Toronto, York University and Queen's University Belfast used measurements of the phase variations of six exoplanets obtained by the Kepler space telescope to forecast their daily weather cycle. "We determined the weather on these alien worlds by measuring changes as the planets circle their host stars, and identifying the day-night cycle," said Lisa Esteves, a PhD candidate in the Department of Astronomy & Astrophysics at the University of Toronto, and lead author of the study published today in The Astrophysical Journal. "We traced each of them going through a cycle of phases in which different portions of the planet are illuminated by its star, from fully lit to completely dark," said Esteves. Because the planets are very near to their stars, they are expected to rotate counter-clockwise – just as the majority of objects in our solar system do – with the right side moving in the direction of each planet's orbit. This causes an eastward movement of the planet's surface and therefore an eastward circulation of atmospheric winds. As a result, clouds that form on the planet's night side, where temperatures are cooler while it faces away from its host star, would be blown to the planet's morning side. "As the winds continue to transport the clouds to the day side, they heat up and dissipate, leaving the afternoon sky cloud-free," said Esteves. "These winds also push the hot air eastward from the meridian, where it is the middle of the day, resulting in higher temperatures in the afternoon." For four of the planets, the researchers saw excess brightness in the Kepler data that corresponds to when the morning side is visible. For the other two, they saw an excess when the evening side is visible. "By comparing the planets' previously determined temperatures to the phase cycle measurements provided by Kepler, we found that the excess brightness on the morning side is most likely generated by reflected starlight," said Esteves. "These four planets are not hot enough to generate this excess light through thermal emission. "The excess light seen on the two very hot planets can be explained by thermal emission," said Esteves. "A likely explanation is that on these two planets, the winds are moving heat towards the evening side, resulting in the excess brightness." The Kepler telescope was the ideal instrument for the study of exoplanet phase variations. The very precise measurements it provided and the vast amount of data it collected allowed astronomers to measure the tiny signals from these distant worlds. Most of the planets examined in this study are very hot and large, with temperatures greater than 1600 degrees Celsius and sizes comparable to Jupiter – conditions far from hospitable to life but excellent for phase measurements. Kepler data has been used in the past to measure the temperature of these planets, but this is the first instance in which phase variations were used to measure the morning- and evening-side specific brightnesses of a collection of planets. "The detection of light from these planets hundreds to thousands of light years away is on its own remarkable," said study co-author Dr. Ernst de Mooij, the Michael West Fellow at the Astrophysics Research Centre from the School of Mathematics and Physics at Queen's University Belfast. "But when we consider that phase cycle variations can be up to 100,000 times fainter than the host star, these detections become truly astonishing." "Upcoming space missions should reveal many more small planets around bright stars that will make great targets for detailed studies," said co-author Ray Jayawardhana of York University. "Someday soon we hope to be talking about weather reports for alien worlds not much bigger than Earth, and to be making comparisons with our home planet."